Always interested in alternative concepts and other EV’s in general, Sono Motors has been on my radar for quite some time. 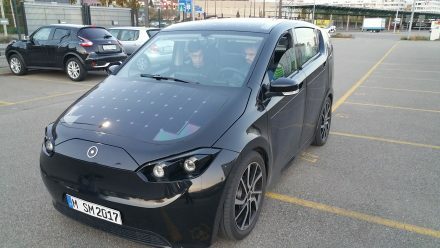 Their USP is being able to harvest the energy of the sun during the many hours a car usually spends not driving and parked outside. A sunny day adds up to 30km range … totally FREE thanks to the sun. 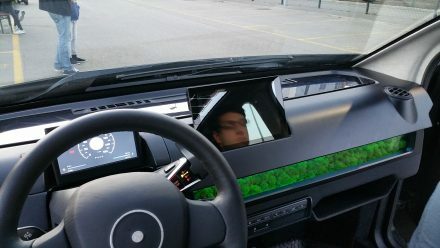 This concept, coupled with some very clever thinking (instead of using custom parts, why not buy existing ones and save on development costs, making the car able to provide energy on the go, moss as an air filter, etc.) 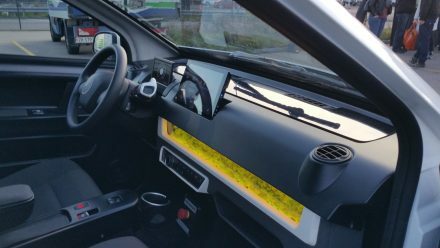 makes the Sono one of the most advanced light-weight EV’s out there. I got to visit their Zürich show – a tightly regimented affair – in November 2017. This entry is about the details I was able to glean from their presentation and test drive. I was assigned a 5-minute slot for my test drive. The event venue was on a closed-off part of a parking lot outside of Zürich. There are two versions of the car – black and white. I’d want one of these! Both cars alternate as show-cases and test-drives. First impressions are impressive. Given that the young people behind the project don’t have any extensive automotive experience, the result is surprisingly drive-able. 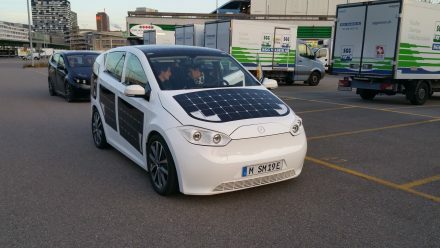 The car is covered in solar panels – I’m not with most of the visitors here claiming that the white car with dark solar panels looks weird. 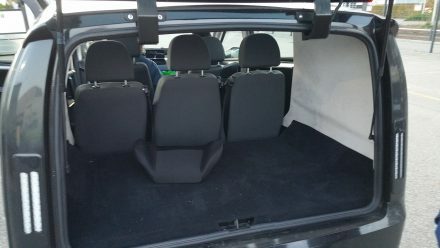 A black car is difficult to keep cool in summer and overall looks much grubbier in winter in Switzerland, since the salt used to clear the roads dries as a bright white film which is much less problematic on a white car. The inside feels airy and generous room-wise. There is plenty of headroom for me and the seats are comfy. 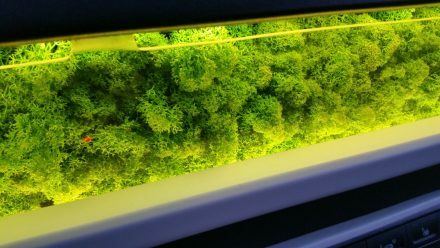 Whoever came up with the moss idea is a genius – it is not only a gorgeously complex addition to an otherwise minimalist car design; it takes center stage to all glances around the car. 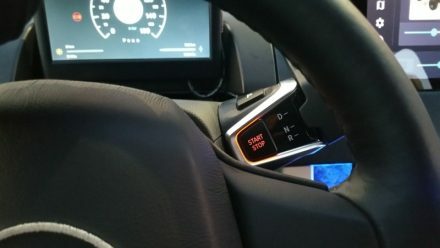 I am not convinced that the Sion needs a second display behind the steering wheel > make the center console screen bigger and put all controls there. 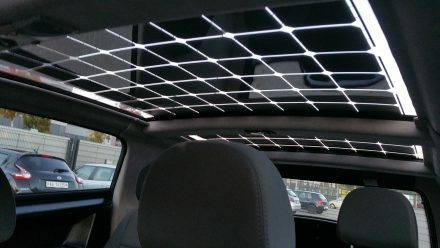 Look at the living organism in your car! 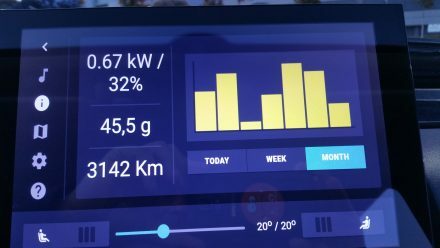 The Android app driving all car interactions was designed by someone sick and tired of too much faffing about with pixels and “good-looking” graphics. It’s a gorgeous interpretation of minimalist design by someone who knows what and EV driver’s needs are. Brilliant design. 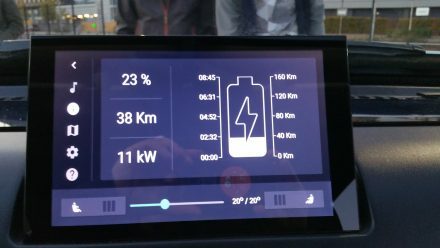 Finally a charge display that makes sense! 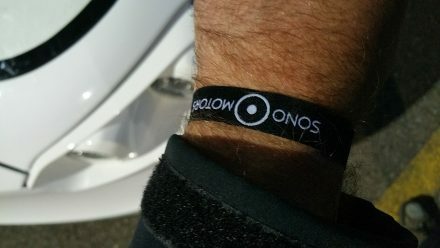 The application is fully integrated into Sono’s car sharing application. I am a proponent that cars should be shared as much as possible. It is an awful waste of money and material to have a car sit around for 23h a day just to be ready for 20-40 min of driving at the end of a day! 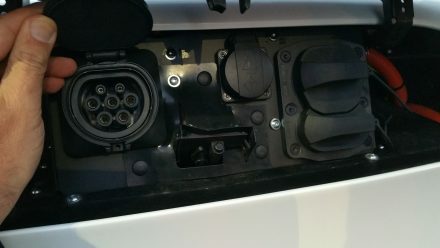 I really like the unusual feature of being able to either provide electricity (220v) or charge other cars via a 6kW Type2 connector. Genius & really useful! 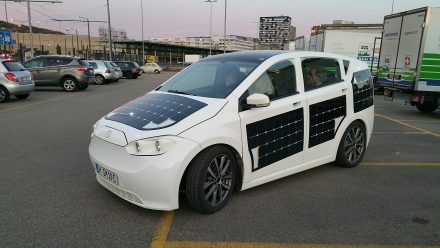 The range of this car with its 30kWh battery is more than enough for normal use. If someone on a camping site needs some light and wants to boil some water or cook some food, this might be entirely feasible using the energy harvested during the day. Wow. Space-wise the Sion needn’t be worried to be compared to others: It’s SUV-like. Lots – and I mean LOTS – of space is available for transporting stuff. A standard family is going to be more than well-served. Another feature I like is the tow bar – although not relevant for me as a horse owner (need much more energy and vehicle weight to be able to tow my horse-trailer with two horses – the only current EV able to do this is Tesla’s Model X) – I can see many a builder using it with a smaller trailer and using the car’s energy to power the power-tools required during a normal day’s work. As a special bonus, I was able to treat one of Sono’s founders to a test-drive in a TWIKE. He obviously knew the TWIKE but had never hat the chance to drive one himself. There you go – Win:Win! At a price of €16k, this car is not only very affordable but also has a superior ROI. Coupled with Re.Sono, which totally disrupts the current black-box repair regime of current car manufacturers, you will be able to keep your Sono running at a minimal cost, wherever you are. Did I mention that I was impressed by this car? Get it, pre-order it. I already have the most uncompromising electric car available. If you want to get a family car with a similar DNA, a Sion would be the closest you could get.